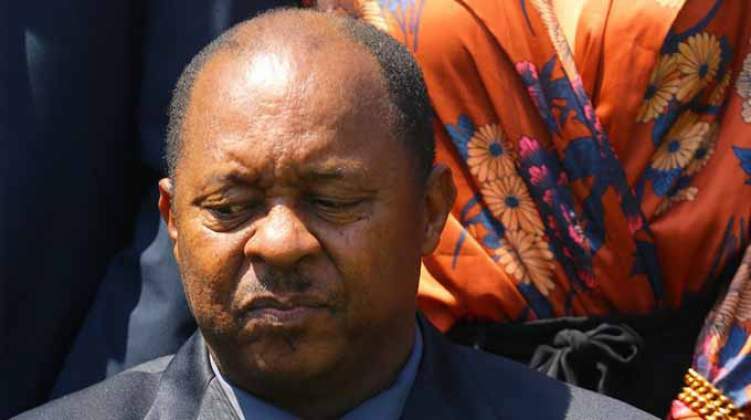 THE Minister of Health and Child Care, Dr Obadiah Moyo, has condemned the Burombo flats in Bulawayo's Nguboyenja suburb as unfit for human habitation and a health time bomb. Dr Moyo implored council to urgently solve the water and sewer problems at the flats accommodating hundreds of residents. The hostels at Burombo flats have communal toilets and an average of 50 people share a toilet after the city council shut down male toilets years ago. The place has no electricity. Speaking during a visit to Burombo to assess the living conditions last Friday, Dr Moyo said the place was conducive for a cholera outbreak. "This is a health hazard and we condemn it. We are fighting cholera yet we are creating it here. This is a major source of cholera; this is the type of facilities we are saying should be improved. We implore the council to look into this matter seriously and ensure that residents live in a clean environment", he said. Council officials told Dr Moyo that their plan is to eventually move Burombo residents to another place when they have identified another facility so that they can renovate and rehabilitate the flats. "We can't continue seeing this type of thing happening. I'm really happy that we are working together to correct this health hazard. Work out your plan (Council) to ensure that at the end of the day this type of living does not exist in Bulawayo. We want a clean Bulawayo. "But the main issue is that we have to fight all the possible causes of cholera and this facility is a very conducive environment for cholera. Furthermore the director of Health Services has pointed out that there is overcrowding here and they have had cases of TB," he said. Dr Moyo said the place faced an outbreak of both cholera and TB. "Again it's a compounded situation, a double edged sword. We now have the issues of TB which has been confirmed and possible cholera which we are now trying to avoid. We are talking of prevention of cholera and this means that we should have a clean living environment. So this facility has got all the possibilities of getting a health explosion, it's a time bomb," he said. "So, we have implored the council to ensure a hygienic living condition and for them to start at least by the sewer and water lines which service these buildings so that we don't end up with cholera. We don't want it to be another epicentre." The Minister had a reality check when during his visit, one person flushed a toilet from the third floor and raw human waste gushed from a pipe to the ground. Participants in the tour were shocked at how the people lived there with human waste in their backyard. "I saw there is a lot of sewage sipping, someone just flushed from the top and the sewage just arrives at the bottom and floods the whole area creating a very very unhealthy, unhygienic environment. "They have already started something but we've encouraged them to go inside so that they can work on the ablution facilities inside than just working outside. We want a situation where there is no sewage floating all over the facility around the buildings," Dr Moyo said. He said he would take the matter to the inter-Ministerial committee chaired by the Minister of Local Government, Public Works and National Housing, July Moyo, who would advise on the support they can render. Bulawayo City Council director of Engineering Services, Engineer Simela Dube, said the solution was for the people to be moved out so that internal works can be conducted freely. "The biggest challenge is that the reticulation is totally collapsed which requires that the building be evacuated so that internal works can be done and it can be connected to the sewer. That has been the recommendation from long back," he said. Eng Dube said the local authority had challenges removing the occupants from the buildings. "What has been happening is that progressively we remove the people but as soon as we remove them you find the building with fresh occupants. So what has be done is that the building must be barricaded once people are moved," he said. Bulawayo Town Clerk Mr Christopher Dube said the overcrowding had resulted in high cases of TB being reported. "This is a very serious problem and we are very lucky that we haven't had cholera cases. It's a problem waiting to happen. There is Sidojiwe and Cowdray Park and other settlements around the City of Bulawayo which were created by Umguza Rural District Council and the situation is like this. Cowdray Park is the biggest slum here in Bulawayo because we've got about 15 000 properties where people are using pit latrines. It's just terrible," he said. Health Services director Dr Edwin Sibanda said the flats were the epicentre of TB due to overcrowding. 'If you go to our statistics in Mzilikazi, it has the highest number of confirmed TB cases. It's Mzilikazi and Cowdray Park which have the highest number of TB cases. Yes, we have had diarrhoea cases but they have not been confined to this building. We want something to be done here, in particular the overcrowding because we really have a TB problem in this place," he said.